Origin of the active ingredient: GETROPIN is a Recombinants Human Growth Hormone. GETROPIN is produced by recombinant DNA technology in E.coli secretion expression system. 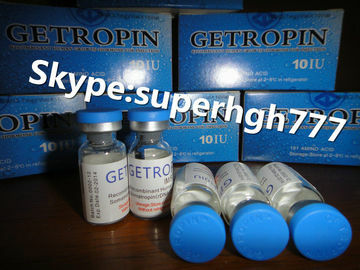 GETROPIN has the same amino acid sequence with 191 residues as the native human growth hormone produced in the human body. – Skin thickening, wrinkle reducing. – Energy and sexual function increase. – Size of liver, pancreas, heart and others organs restoration. For anti-aging, general health, fat mobilization, a dose of 2-3 IUs per day will be sufficient for the majority a dose of 1.5 to 2.0 IUs is considered to be full replacement dose for those in their middle-age and beyond. For gaining lean muscle and substantially improving body composition. A dose of 4-8 IUs per day will be necessary. Most people will respond very well at a dose of 4-5 IUS per day. For maximum benefit in this regard, the addition of Testosterone, Insulin, and low-dose t3 would be something to seriously consider. More on this in our comparative cycle guide of HGH/Insulin/IGF. The recommended dosage for injection is 0.1-0.5IU/kg/day, inject before sleeping daily at the same time and the injection site should be changes frequently to prevent lipoatrophy at the site, or follow the physician's advice.